Your guinea pig is good at entertaining himself, but a few simple homemade toys can help. Just about anything that doesn't have sharp edges or that would harm your pig if he chews on it can serve as an entertaining toy, but there are a few you can make that are guaranteed to be a hit. Create tunnels and runs out of large PVC pipes or cardboard tubes. Guinea pigs love running through the tunnels, even if it's only a short section of straight pipe. Make sure the tube is large enough for the pig to fit through easily. Cut the bottom off of an oatmeal container to create a short run, or connect several pieces of PVC pipe for him to run through. If you make a very long run, cut holes at random places in the top or side of the pipe for your guinea pig to enter and exit so he doesn't feel trapped in the tunnel. Offer old toilet paper, paper towel and gift wrap rolls as chew and play toys for your guinea pig. Make sure all of the product it held is removed. 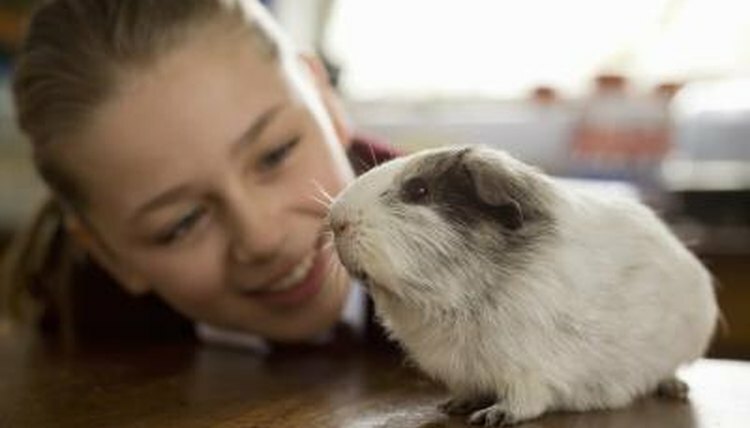 Place a plain short or cut roll in with your guinea pig and let him drag it around or chew on it. Stuff a short roll with parsley, broccoli, pumpkin leaves or another safe treat and let your guinea pig have fun working to get the treat. Crumple up a piece of clean copy paper into a ball and roll it to your pig. He will enjoy carrying it around, digging at it and pushing it around with his nose. Hay bundles give your guinea pig a toy that he can also use to satisfy his desire to chew. Gather up a handful of hay, about as much as a pound of spaghetti, and tie it tightly in the center with raffia or any other natural material that is safe for your pig to eat. You can also cut off a 1-inch section of toilet paper roll and stuff the hay through it. Keep in mind that legume hays, like alfalfa and clover, can cause obesity if fed in large amounts, while grass hays, such as timothy, orchard or Bermuda, have fewer calories and can be offered in larger amounts. Cardboard boxes and brown paper bags are simple toys that can entertain your guinea pig for hours. Cut a hole in the side of a cardboard box so your pig can run in and out of it. Turn the box upside down so he can enjoy pushing it around from the inside. Give him an open paper bag on its side, and like a cat, he will enjoy hiding inside of it, running in and out and climbing on top and crushing it.